A quilters ruler used to make perfect picot's or prairie points in a continuous row of material. Finished points measure 1.5" height from top to bottom with a 3" width at the base. 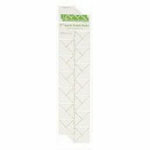 The ruler measures 25"L x 6"W and is made of duarable polycarbonate plastic.